Numerous innovative ideas are developed during the studies. However, young graduates do often not have sufficient financial means to realize their dream of their own company. This is where Venture Kick can offer support. Venture Kick is a philanthropic initiative of a consortium of private donors. 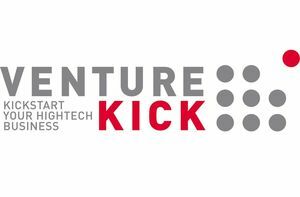 Venture Kick not only offers the young entrepreneurs financial support, but they also benefit from an intensive coaching and a broad network of specialists and investors. Financing begins even before the formation of a company. In three different stages, innovative start-ups can receive up to CHF 130,000 per project. The first stage is to present the innovative idea to a jury. If the pitch arouses interest, the entrepreneur can receive support of CHF 10,000.-. In a second phase, project teams structure their business ideas, address potential customers as well as initial and strategic business partners in order to create a solid business plan. Then it is a matter of convincing the jury to achieve a second "kick". In the final phase, the teams have to be ready to enter the market: they have proven their entrepreneurial performance, created a solid foundation for the implementation of their start-up and can underpin their vision with tangible market feedback. If you stand out with your project, you can get CHF 100,000. This highly structured programme leads to successful entrepreneurial development. The founder and CEO of IMMOMIG AG, Patrick Maillard himself won the "Venture Leaders" competition with his start-up in 2007. Today, Mr. Maillard himself sits on the jury and decides who is the winner with the best idea. The now aspiring company IMMOMIG AG would like to pass on some of its own success and thus support future start-ups.